SBS TV station held its 2011 SBS Drama Awards on the last day of the year, December 31st, 2011 to recognize the excellent actors, actresses and dramas of the year. With the many popular and high quality dramas been produced by SBS over the year, the awards ceremony has been eagerly awaited as the fight for the awards this year was pretty intense. 2011 SBS Drama Awards MC are popular actors Ji Sung and Choi Kang Hee, both of them played a couple in SBS’s drama Protect the Boss. 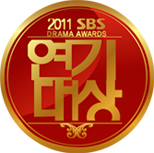 Here’s the complete full list of winners for 2011 SBS Drama Awards. Note: Drama Special is for Wednesday and Thursday drama series, while Special Planning Drama is for Monday and Tuesday drama series.